It is another year and another time for a collaboration with Mattel's Barbie. 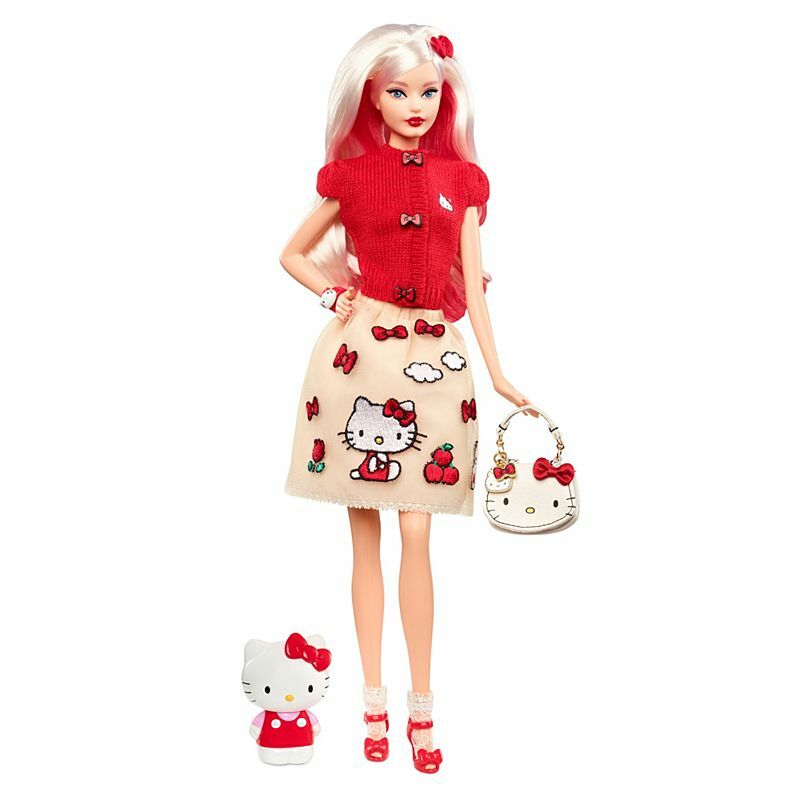 As someone who is more selective with what I add to my collection, this Barbie doll collaboration with Hello Kitty would be the very first one. There has to be something really special about a Barbie collaboration to spark my interest. 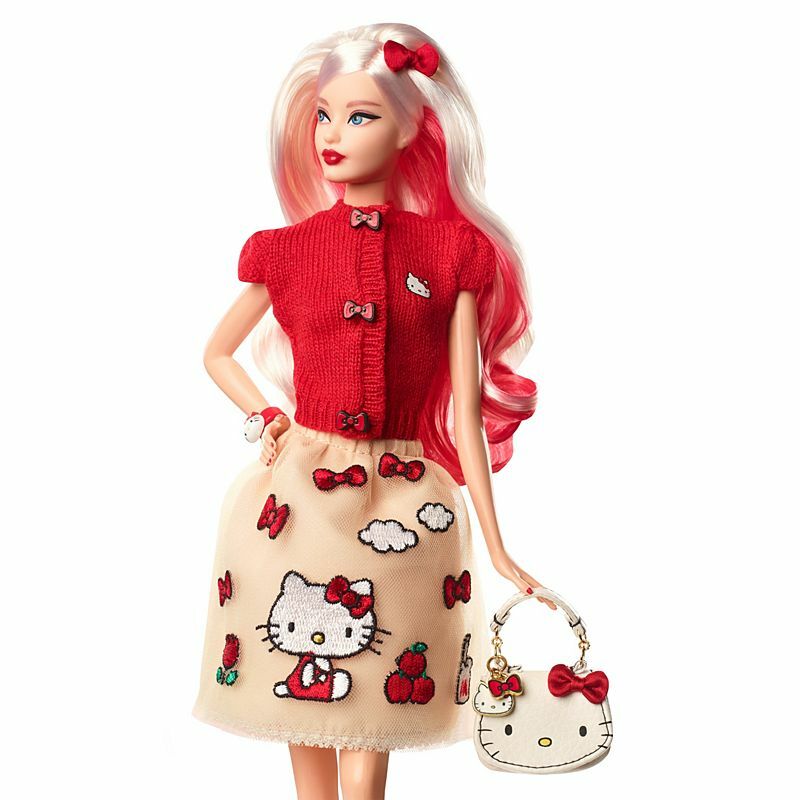 With past Barbie collaborations with Hello Kitty, it has never really made me sit up and take notice of the doll. The first thing you notice about the doll is that her dress has a Hello Kitty image. It looks like a small patch glued on. As read on the website of Mattel for this Signature Barbie, the age range are for the adult collector. The design of the dress isn't exactly fashion forward for the average female adult. It doesn't have the stylish fashionista look. And, Barbie is a fashionista - the very icon of fashion. The design on the dress isn't something what most average women would wear on the streets comfortably without being a little self conscious, if the dress would make her appear a bit childish... for an adult. As for the small HK figure, it feels like an after thought. I do not see the connection to the doll. It's like the designer has spent overrall 5 minutes planning the whole package and this is the final result. 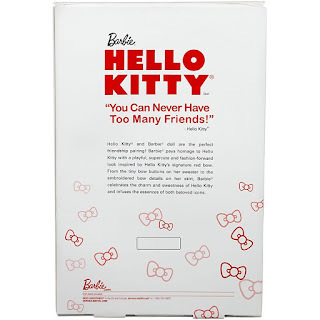 It is very disappointing that Mattel did not give the design to a real Hello Kitty fan. 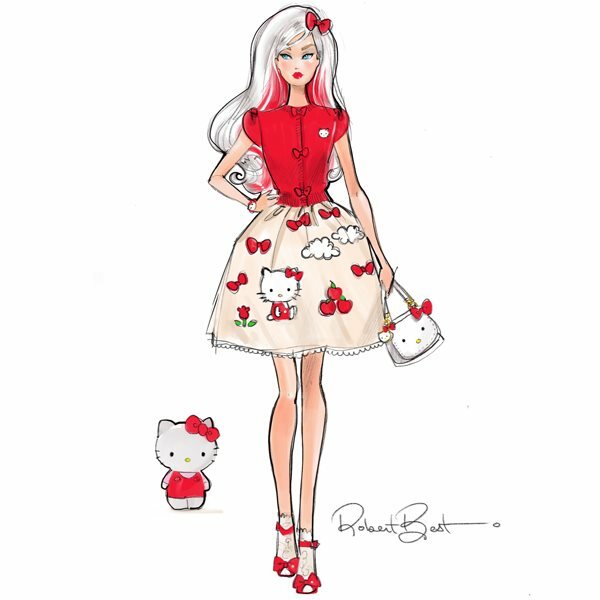 Surely, there is one Barbie designer that passionately and genuinely loves Hello Kitty. You would think there would be more creativity and thought into designing Barbie's dress or outfit. I can think of two styles that I would have love to see on Barbie. Whatever the designer chooses for the style of the Hello Kitty dress or outfit, it is the centerpiece that should draw your attention and keeps that interest for more than a second. Or another safe bet would be to dress Barbie in the classic Hello Kitty jumpsuit and striped shirt. What saved the rating was the beautiful white cover box that came with the doll. The box cover is essentially the main attraction to the whole collaboration. 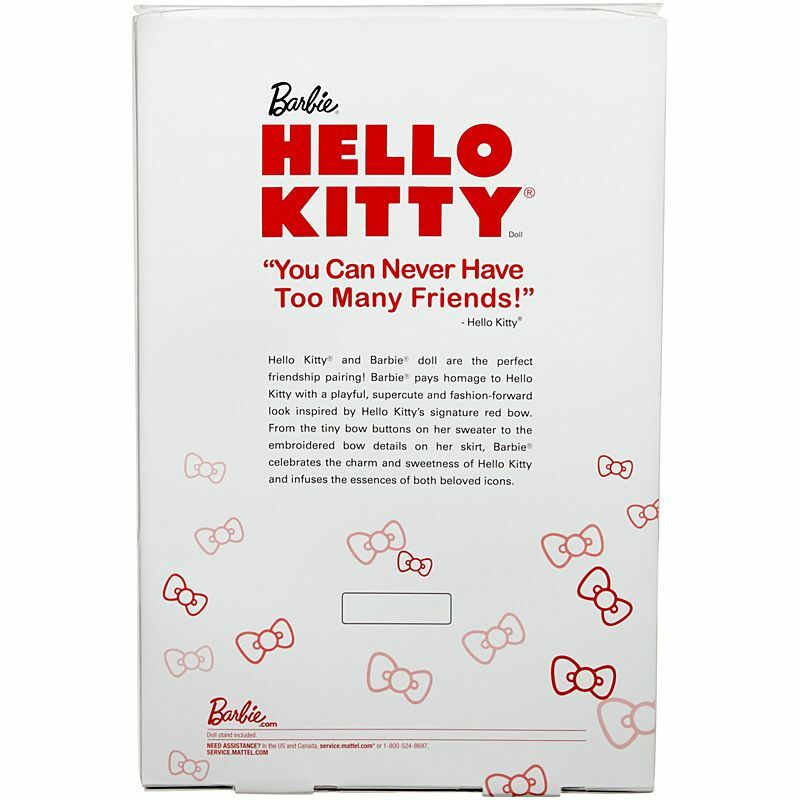 The 3D red bow on the box pops out so much that it contrasts nicely with the Hello Kitty outline shaped face. I love that the Hello Kitty face isn't a flat surface. The whole color scheme of just the face as white and being the same color as the box is aesthetically beautiful. One of the highlights for this doll is Barbie's colored hair in the inner side of her hair, behind her neck. It screams fashionista chic. 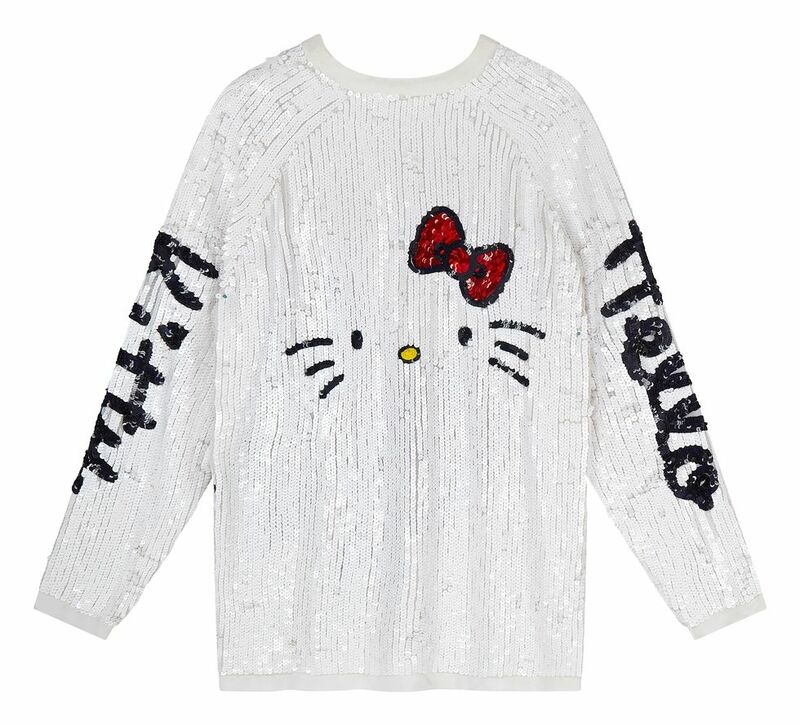 Then, there are the Hello Kitty accessories. The Hello Kitty handbag. Lovely. What every HK collector owns in real life. Lastly, the Hello Kitty wrist watch or bracelet. Very nice touch of homage to the very kitty. Overrall design, it is a nice addition to my collection. Hello, Barbie!